Orisys Infotech provides bespoke car rental solution for Cyprus car rental companies, travel agents, taxi operators and travel management companies as per their requirement and business need. Having a fully functional car rental website with online reservation system can make your car rental business more interactive online, resulting more bookings and less operating cost. We are a car rental website development company and serving many car rental companies in Cyprus and in other countries. We have developed vehicle rental websites with car rental, transfer booking and taxi rental reservation system. Since we have the travel industry experience, we know what should be the look & feel of your website and what booking options on your website can make it more customer oriented and user friendly with scope to upgrade your website in future. As an experienced car rental software development company we thoroughly analyze your car rental requirement, provide innovative design, develop car rental booking engine to suit your requirement and provide support & maintenance to run your car rental website hassle free. With our customized car rental solution you can extend the features of your car rental website and booking system in future as per your requirement to beat the competition . We provide car rental solution for car rental companies as per their requirement, because we understand that every car rental company has different requirement and business logic. 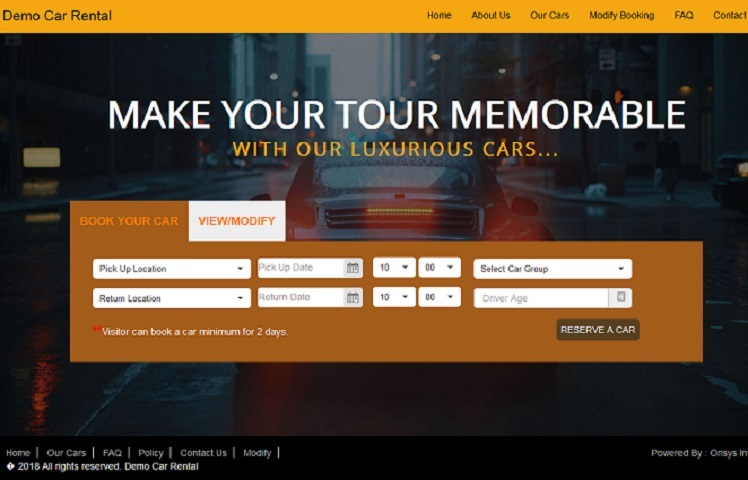 For this reason we provide customized web application in order to meet vivid requirement of different car rental agencies and travel companies.